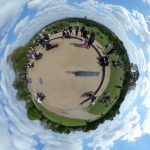 Primrose Hill Park - MagicVillage.London - London's Best Panoramic View. One of the best clear views of Central London! It is definitely romantic and in the summer time the younger crowd fills the place with games, picnics and joyful drinks. Take your camera! Like Regent’s Park, this area was once part of a great chase, appropriated by Henry VIII. Primrose Hill Park, with its clear rounded skyline, was purchased from Eton College in 1841 to extend the parkland available to the poor people of north London for open-air recreation. An oak tree, known as “Shakespeare’s Tree” stands on the slope of the hill, planted in 1864 to mark the 300th anniversary of Shakespeare’s birth. A large crowd of workmen marched through London to watch the planting ceremony in 1864. A replacement tree was re-planted in 1964.